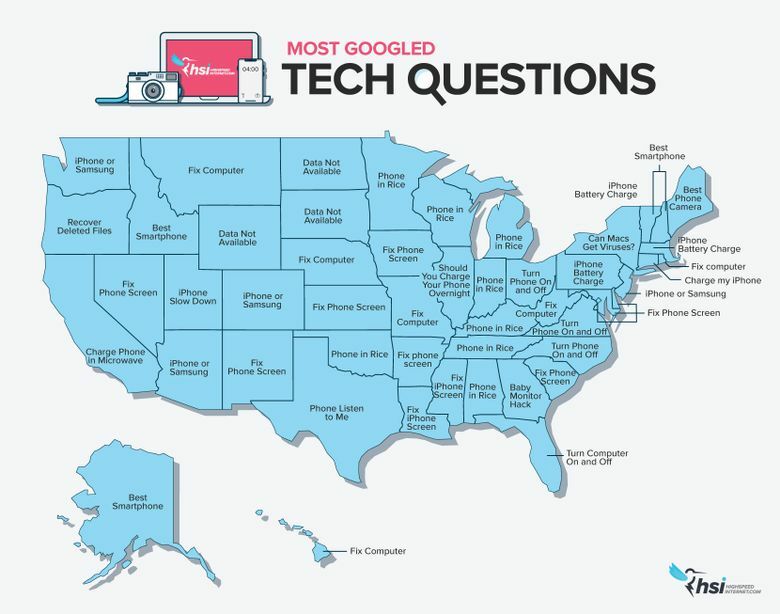 See which tech questions each state is searching for the most, and which oft-googled tech myths are actually true. We might not be the smartest state in the nation, but at least we’re not trying to charge our phones in the microwave. In Washington, our most-googled tech query is about comparing the benefits of getting an iPhone versus a Samsung, according to a new study by the internet information website highspeedinternet.com. People in California, however, have other questions. In fairness, the majority of each state’s residents search for answers to questions that seem completely reasonable: how to fix a computer or a phone screen, or what’s the best smartphone. But there are a few notable outliers and oddities. People in Georgia, for example, are worried that baby monitors can be hacked. And guess what? Those fears are legitimate. Other myths or partial truths are common throughout the country, the study found: More than 50 percent of people believe that charging their cellphone overnight can ruin the battery, 31 percent believe that an airport X-ray machine can wipe the memory from a phone or laptop, 30 percent think a computer must be shut down every night for it to run properly and 12 percent think deleted files can never be recovered. Got a question or want insight into personal technology? Check out Patrick Marshall’s weekly Q&A here and Jeff Carlson’s Practical Mac column here.